The humble oat epitomizes the concept of food as your best medicine. Oatmeal is very inexpensive, easy to prepare, and has equally important nutritional and health benefits. Oatmeal extract, the liquid left from cooking whole oats, is one of the most soothing and effective treatments for dry skin and sunburns, and can help heal damage from more serious skin conditions such as serious eczema and psoriasis. 5 A simple poultice made from a muslin bag filled with oatmeal and chamomile flowers is one the most healing things you can use for damaged skin. There are many perfectly fine, natural skin products that contain oatmeal extracts but in this case homemade is fresher, works better and costs much less. 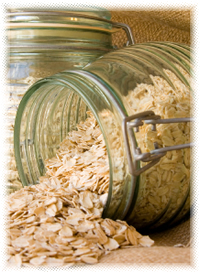 Preparation Methods & Dosage :Eat rolled oats in least processed forms to get the full cholesterol-lowering benefits. The dried milky tops make a soothing herbal tea. Oat extracts are often used as an additive in skin care products, you can easily make your own by using the liquid from cooking rolled oats. 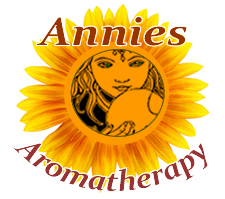 Avena glycerites and tinctures are best made from the fresh plant, and are available for purchase for us city folk. Oats Side Effects: Eat whole grain oats as often as you can, however, be aware that the prepackaged, instant oatmeal mixes sold today have been stripped of the nutrient value and are filled with refined sugars. For oatstraw tea, it is best to ensure that it is organically grown. In selecting the dried herb for tea, choose seeds that are green to green-yellow, seeds are stronger medicinally than the stems. 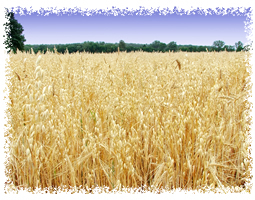 Oats were introduced to North America from Europe and now often grows wild. If you have ever made the mistake of using unseasoned straw for garden mulch, you can attest to that. Gregory L. Tilford. "Herbs for Pets" BowTie Press, (2001) Oats are a healthy food for animals- contains considerable amounts of protein, vitamins, and minerals. Cooled oatstraw teas can be poured directly on dog or cat food as a nervous system tonic for aging or debilitated animals.